The Hôtel du Nord is located in the middle of Corte’s main avenue. Renowned since it opened, the hotel has lost none of its charm and reputation. Hotel du Nord offers rooms full of authenticity. Although keeping its authenticity was our priority, we have also made some renovations to better meet the needs of our customer. Enjoy our fully equipped rooms with all modern comforts such as satellite TV, telephone, Wi-Fi connection, air conditioning, and even a multi-jet shower. We also have a snack-bar where you can spend some fun time with friends and family. 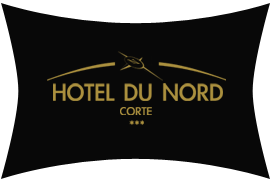 Located at 1 hour from the port of L’Île-Rousse, and 90 minutes from the airport of Ajaccio, L’ Hôtel du Nord welcomes you in the heart of Corsica. The hotel is open all year round providing pleasurable experiences for holidaymakers, tourists and professionals in town for a business trip. The stay at the hotel is a rare opportunity to discover the treasures of the region such as our beaches, beautiful lakes, natural swimming pools, or the hundred-year-old forests of the Regional Natural Park. Book a room at the Hôtel du Nord!